So grateful for God's continuing blessings during my mom's visit! Saturday was fabulous. We spent the day down south, first driving along the Wisconsin side of the Mississippi to the town of Nelson to visit the great cheese shop there. 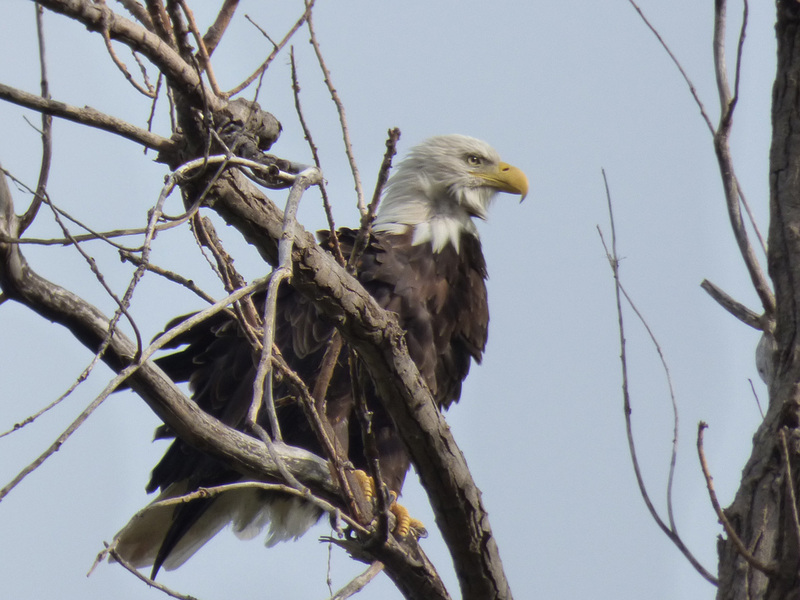 On the way, when I stopped at a pull-off, we were blessed to spot a bald eagle sitting in a tree on the other side of the highway, and as we watched it called its mate and then there were two of them flying over us. Such a treat for my mom to get to watch them so close! From Nelson we went to the National Eagle Center in Wabasha, where we got to see the birds they have on display (unable to be released due to their injuries) and their great show about eagles. We also discovered the Castlerock Museum in Alma, Wisconsin which has an amazing collection of arms and armor spanning from Greek times onward up to the later 1700s. Neat to see the styles changing during the Renaissance and changing again as the earliest guns were developed. On Sunday we went to the church I attended as a child and my mom got to meet some of the people she knew from decades past. Then we went out for the fantastic brunch buffet at Lake Elmo Inn (the dessert spread was astounding). So it's gotten rainy and humid of late, but what a blessing to have such fantastic weather from Wednesday through Sunday. The low humidity in particular was quite cherished. Very grateful that autumn is coming after such a crazy and busy summer!